Roland TD-25KV V-Drums in action. With their unrivaled sound quality, playability, and expressiveness, Roland’s top-of-the-line TD-30 V-Drums are the number one choice of pro players around the world. Now, with the introduction of the new TD-25KV and TD-25K V-Drums sets, drummers can access the acclaimed benefits of high-end V-Drums at a more affordable price point. Featuring the newly developed TD-25 Sound Module, a full compliment of mesh-head pads, and easy sound customization, the TD-25KV and TD-25K are perfect for serious players who want to take their electronic percussion to the next level. The key to the great sound of the TD-25KV and TD-25K V-Drums kits is the all-new TD-25 Sound Module, which includes SuperNATURAL technology with Behavior Modeling directly inherited from the flagship TD-30. The TD-25’s sounds respond naturally and organically to your touch, providing the dynamic, interactive feel that pro-level players demand from their instruments. Every subtle nuance is smooth, detailed, and accurate, from rim shots, rolls, flams, and ghost notes on the snare to dramatic crash hits and sustained cymbal swells. The all-new TD-25 Sound Module provides high-end sound for the TD-25KV and TD-25K V-Drums sets. To take full advantage of the TD-25 module’s superior sounds, the pads and cymbals in the TD-25KV and TD-25K V-Drums kits deliver the natural playability that have made V-Drums famous. Both kits include mesh-head pads for the snare and toms, providing authentic feel and response that inspires you play. The TD-25 module supports positional sensing on the snare, a high-end feature previously only available in top-level V-Drums modules. Positional sensing provides subtle, organic tonal changes depending on where the pad is struck, and the PDX-100 10-inch snare pad in both kits is ideal for taking full advantage of this highly expressive capability. 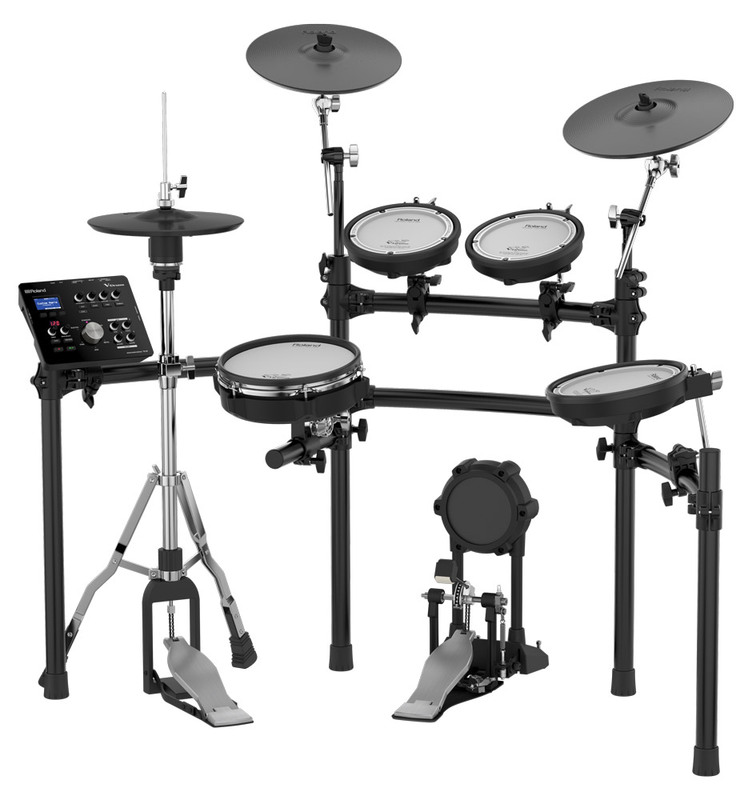 Roland TD-25KV V-Drums set (with optional kick pedals and hi-hat stand). The TD-25KV includes two PD-85BK 8-inch pads for rack toms and one PDX-100 10-inch pad for floor tom, while the more affordable TD-25K includes two PDX-6 6.5-inch pads for rack toms and one PDX-8 8-inch pad for floor tom. In addition, the TD-25KV comes with two CY-12C 12-inch crash cymbals, while the TD-25K includes one. Both kits also come with one CY-13R 13-inch ride cymbal. The cymbals offer a natural swinging motion and support chokes, bow/edge sounds on crash, and bow/edge/bell sounds on the ride. 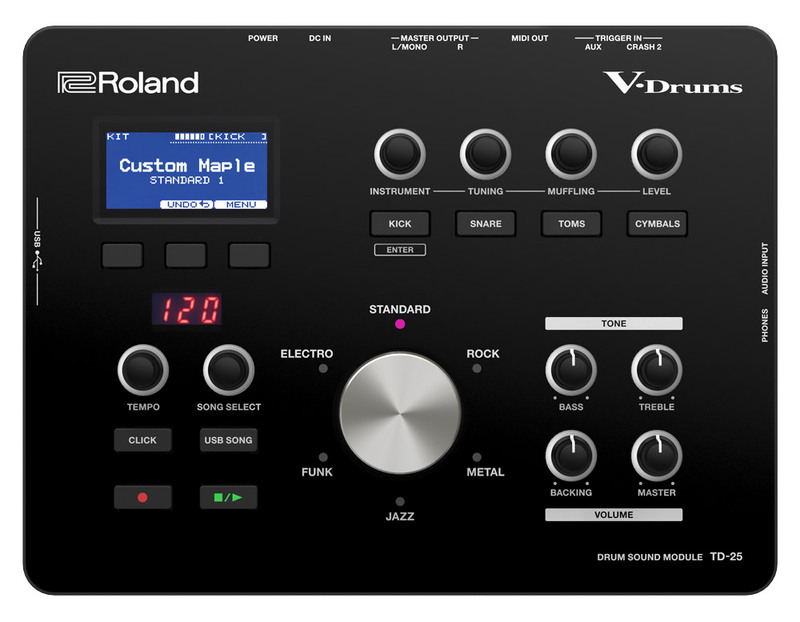 Roland TD-25K V-Drums (with optional kick pedal and hi-hat stand). The VH-11 V-Hi-Hat is included in both kits, and mounts on a standard acoustic hi-hat stand. It features up/down motion and bow/edge sounds for playing traditional hi-hat techniques with a natural and authentic response. Rounding out the kits is the KD-9 Kick Pad, which provides a natural-feel cloth head and rock-solid playability. With the TD-25 module, it’s simple to dial up great drum sounds for any musical genre, from rock and jazz to heavy metal and EDM. A breeze to navigate, the streamlined interface makes it easy to select and adjust sounds. With the large center dial, you can quickly choose kits based on the music style you want to play, and sounds can be edited simply by striking a pad and using the module’s knobs to change instruments and adjust tuning, muffling, and levels. Toms can be edited as a group, a handy feature that really speeds up the editing process. As you tweak sounds on the TD-25, your changes are saved automatically, eliminating the need to fuss with extra steps. If you don’t like your changes, you can quickly undo your edits and return to the previous state of the kit when you first called it up. The TD-25 Sound Module provides an intuitive interface for easy sound selection and quick editing. 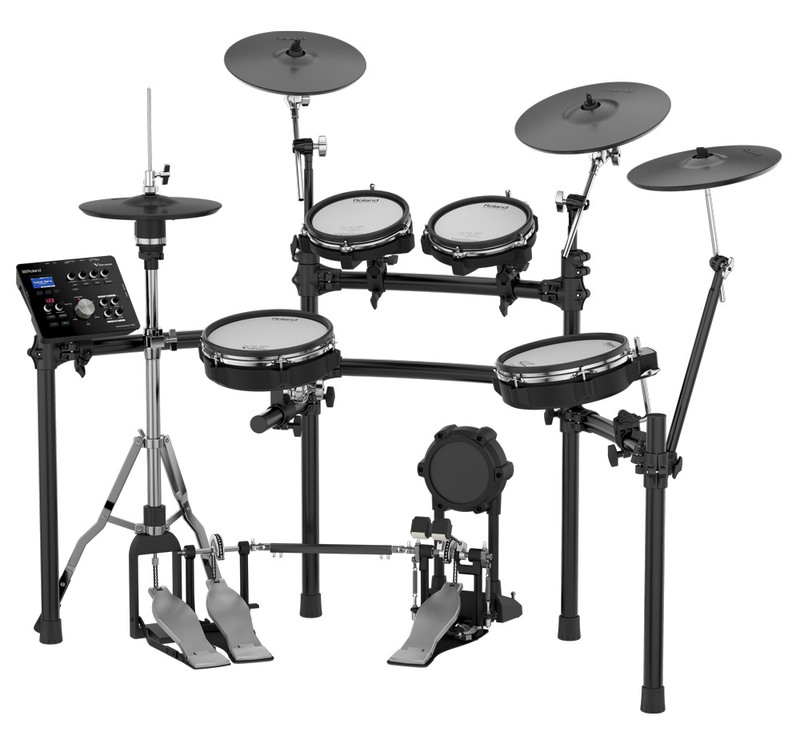 The TD-25 module includes many great features for music practice and overall drumming fun. You can play along with WAV and MP3 music tracks stored on USB memory, and it’s even possible to slow songs down or loop specific areas to learn tricky parts. If you don’t want to mess with USB memory, you can simply plug your smartphone or music player into the audio input and drum with songs from your music library or the web. Rear panel of the TD-25 Sound Module. 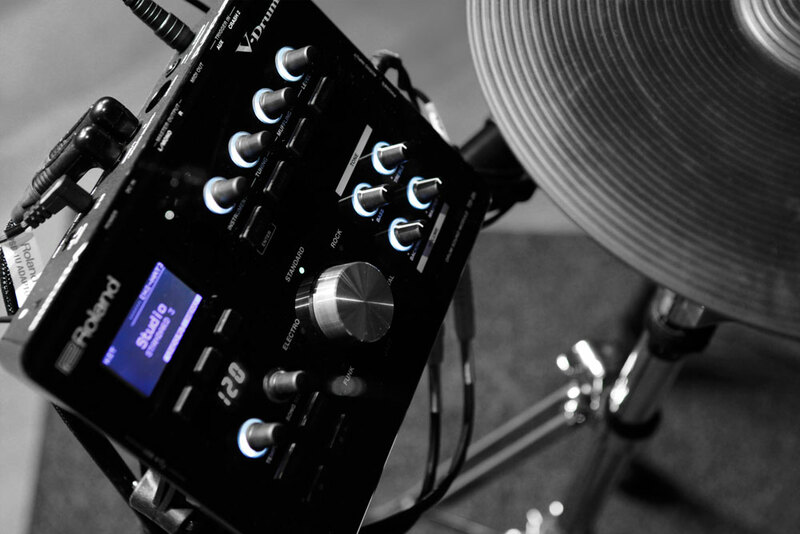 Also included in the TD-25 is a built-in audio recording function, a first for any V-Drums module. This allows you to record drumming performances (along with music playback) as audio files to USB memory, providing a great way to evaluate your performances on the spot and share your playing with others. The TD-25 also includes convenient onboard Coach functions to help develop your timing accuracy. Learn more about these great new drum kits at the TD-25KV and TD-25K product pages.